Sweet bliss. Spring has sprung, the leaves are back on the trees, flowers are blooming and the cycling season is in full swing now. This French recipe is in honor of Paris-Roubaix. 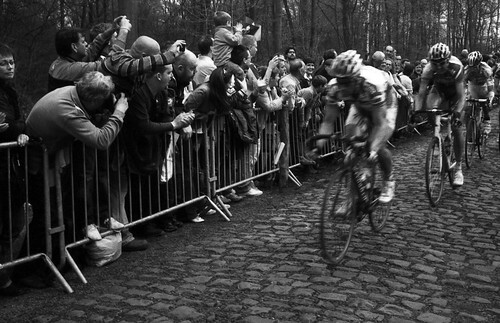 A grueling one-day race featuring some of the best cobbles in the world (or perhaps the worst cobbles depending on if you’re on a bicycle seat or comfy on your couch watching the action). I made this whilst the In-House Taste Tester was doing his own Paris-Roubaix in the streets of Washington DC. (Easy to do with all the post-winter potholes out there.) Upon his return, he opened the door, and was greeted by the warm smells from the kitchen. He immediately remarked, “Oh, something smells good.” And, he soon discovered that it also tasted good, too. I’ll admit, the gruyere may be a bit of a spurge on the wallet, but worth it as the earthy mushrooms (with the nice little bit of brandy) go perfectly with the flavors of the mixed cheese. By the way, while Paris-Roubaix may be one of the most difficult races, this recipe is beyond easy leaving you more time to watch this epic race. Preheat the oven to 425 degrees. In a large saute pan or skillet over medium heat, saute the mushrooms in 2 tablespoons of the butter or olive oil until they are lightly browned. Add the spirits, then cook over a high heat for a few moments. Remove from the heat and add the shallots, garlic, and stock. Set aside. Cook the pasta in a large pot of salted boiling water until al dente. Drain well, then toss with the mushroom mixture, salt, pepper, chives, the remaining 1 tablespoon butter or olive oil, and about a third of the Gruyere and Parmesean. Spoon into a 12-inch gratin dish, or into individual casseroles. Springkle with the reminaing cheese and bake until bubbly and golden brown. Serve right away. A traditional macaroni and cheese kicked up a notch with some jalapenos and tomatoes. So good. So yummy. Get in the kitchen and make this. ‘Nuff said. – Chop tomatoes. Place in a sieve to drain the juices moving them around occasionally to ensure better draining. – Melt the 3 Tablespoons butter. Combine bread crumbs and cornmeal with melted butter. Put aside. – Cook the macaroni al dente, in a large pot, according to package instructions. Drain and return to original pot and add the remaining 4 Tablespoons of butter. – In a large bowl, whisk the milk, egg substitute, mustard, salt and black pepper. Add 3/4 of the cheese and combine. – Pour the milk and cheese mixture into the pot with the macaroni. – Stir over medium heat until the cheese melts, the sauce thickens and the gets bubbly. – Add tomatoes and jalepenos and stir to combine. – Pour into lightly greased baking dish. Sprinkle the remaining cheese on top. Then add the crumbs. – Add to preheated 350 degree oven and bake for 30-40 minutes until top is browned and the sauce is bubbling. Fusilli comes from the word fuso meaning “spindle” in Italian and was first found in Granducato di Toscana around 1550. This stuff is good because the little nooks and crannies can hold a lighter sauce tightly yet it doesn’t wither when faced with a heavy sauce. For the recipe below, I use a basic dried fusilli, not one formed on a bike spoke, which is more easily found on any grocery shelf. Whether you call them fava beans, horse beans, English beans, Windsor beans or broad beans, one thing’s for sure – these beans have been around for a very very long time and once were the only beans available in Europe. For your bit of trivia: Apparently, the Greek philosopher Pythagoras (a noted vegetarian) completed despised them. Despite this, he is credited with being the root of pharmacogenetics when back in 510 BC he “noted that hemolytic anemia occurs in some individuals after fava bean consumption. Twenty-five centuries later, this enigma was elucidated by Mager et al. ( 51 ), who demonstrated that deficiency of glucose-6-phosphate dehydrogenase is responsible for this adverse effect of bean ingestion.” In other words, some folks may be allergic to fava beans causing an anemic reaction (i.e., tiredness, headache, fever, etc.) Thank you, Critical Care Medicine for that information. On the brighter side, for those of us that don’t have that reaction, this recipe of fusilli con fave e piselli makes a nice rustic meal. I, unfortunately, could not find fresh fava beans, so I resorted to canned – hence the brown hue of my dish. Oh, and don’t forget, you’ll want to serve these fava beans with a nice bottle of chianti…sorry, couldn’t help myself. Finely chop the onion and cook it gently in 3 tablespoons of olive oil until soft. Add the peas and the Fava beans. Season with salt and pepper and let it to cook for 15 minute over a light heat, adding a little stock when needed. Clean the leaks and chop them in thick slices. Add to the sauce and simmer for another 10 minutes. Cook the pasta al dente and pour it into the pan with the vegetables. Stir to combine and season to taste with salt and pepper, if needed. Serve, covered with the grated cheese.